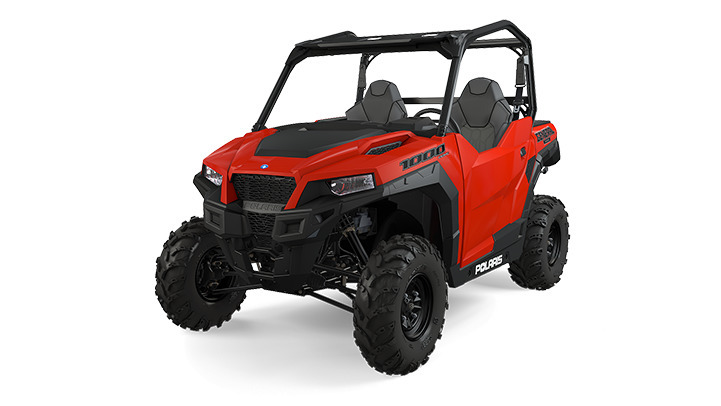 Polaris Industries, the leading manufacturer of off-road vehicles, continues to expand its market leadership by broadening its side-by-side product line-up. Today, the company is introducing the Polaris GENERAL™, the new standard in off-road versatility. This new model will be available in New Zealand from late Q1 2016 onwards. “Today is a great day at Polaris! Once again, we are launching a game-changing new product,” said Tim Blinkhorn, General Manager of RANGER & Polaris GENERAL. “This vehicle is the most versatile side-by-side ever built, made for those who want to battle it all. Whether it’s dominating any trail, or conquering any job, The Polaris GENERAL delivers.” The Polaris GENERAL has class-leading features needed to tackle the trails and a work ethic to battle tough jobs. It starts with a 100 horsepower ProStar® 1000 engine delivering the most power and torque. The engine accelerates 0-40 mph in 3.6 seconds, thanks to a best-in-class power-to-weight ratio. When it’s time for work, the Polaris GENERAL brings the biggest payload of 498 kg and a class-best 272 kg dump box to get the job done. For all-day comfort and a locked-in, aggressive feel, the Polaris GENERAL features a completely new cabin for an all-new ride experience. Factory-installed half doors with armrests offer extra protection from debris, and easy in-and-out, work-friendly cab access. The roomy cab features dual bolstered bucket seats, adjustable for the driver, providing a secure feel and ample leg room, while the thin-film technology under the seat cover provides a dry ride in wet conditions. Space-optimized foot rests for both the driver and passenger also make for a secure ride. of enclosed and in-dash storage. The center console is not only a comfortable armrest but also provides more storage, a 12V outlet and two cup holders. Sealed floor seams and equipment pass-throughs keep the occupants cleaner; while dual removable floor drains allow for easier clean out of the cabin. For a stable and smooth ride, the Polaris GENERAL has an 81-inch wheelbase complemented with a performance-oriented suspension for ultimate control. The vehicle features a dual a-arm front suspension with a class-best 31.12 cm of suspension travel and 33.53 cm rear travel that is calibrated to soak up rocks, roots, bumps and ruts. Standard front and rear sway bars keep the ride level and reduce body roll through aggressive cornering on trails. Ground clearance is also best-in-class, with 30.48 cm unloaded, and 18.8 cm when loaded with 272 kg of camping gear or work materials in the dumping bed. The vehicle also features a full-body skid plate to protect from trail obstacles. 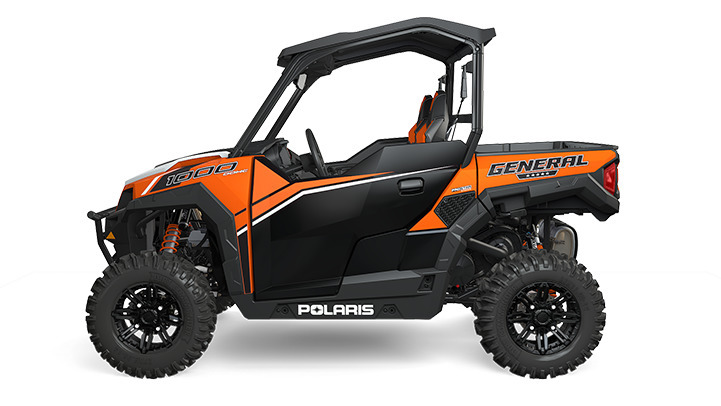 The Polaris GENERAL features a High-Performance, Close Ratio All-Wheel Drive (AWD) system maximizing power delivery to the ground in every condition for a more responsive ride. When needed, all four wheels will engage almost instantly for more forward traction and will revert back to 2WD when it is no longer needed. The vehicle also features an Engine Braking System (EBS) for more control when trailering up to 680 kg and on descents. Along with the AWD and EBS system, a faster steering ratio coupled with standard Electronic Power Steering (EPS) means the vehicle takes the brunt of what the terrain has to offer so the operator can play or work longer. The Polaris GENERAL showcases fully-integrated accessories and with more than 30 brand new Polaris Engineered Accessories™ and 90-plus common fit items, the vehicle can be customized to work more efficiently and get back to the trail quicker. The cab frame features profile tubing providing a 360-degree sealing surface that accepts the revolutionary Polaris Pro- Fit Lock & Ride® Technology providing the best in class cab comfort. Windshields, roofs, doors and rear panels follow the shape of the vehicle, locking directly into the cab frame’s precision contours. The vehicle also accepts the Glacier® Plow Systems, a full line of protection, several LED lighting options and Lock & Ride storage Accessories to quickly and easily add or change as needed for the trail or job. For ultimate class-leading cab comfort, a heater kit and windshield wiper kit provide additional all-weather options. To meet the variety of recreational and work needs, the Polaris GENERAL is available in three different models. The base model is available with in-mold plastic in Indy Red. The Polaris GENERAL Velocity Blue will include automotive-style paint; Sport Low Profile Front Bumper and Polaris HD 4500 lb. (2041 kg) winch; and 14-inch (35.56 cm) Matte Black cast aluminum wheels paired with eight-ply, 27-inch (68.58 cm) GBC Dirt Commander tyres providing better side bite, stiffer sidewalls, better tracking through corners and increased durability in tough work environments. The Polaris GENERAL Deluxe Orange Burst will have all the features included on the Velocity Blue model with premium adjustable Fox Podium X 2.0 QS3 Shocks and the addition of a Polaris GENERAL Pro-Fit Lock & Ride Sport Roof, rear-view mirror and MTX® Premium Soundbar featuring eight-speakers delivering 100 watts of premium audio through Six Performance 3-inch (7.62 cm) speakers and Two 1-inch (2.54 cm) tweeters with Bluetooth connectivity to rock the trails. Polaris GENERAL models will be available in New Zealand from late Q1 2016 onwards.